Presented in collaboration with Elektra. From May 7th to June 18 2011. L’atomisation du temps (The Atomization of Time) draws together images, videos and media installations that use the matrix structure of the digital image to visualize spatiotemporal phenomena. 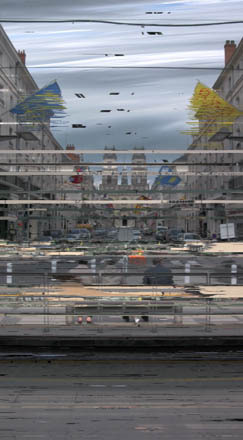 Retracing events lasting between one hour and one year, each representation is the result of a process in which pixels have individually captured fragments of successive moments. This temporal dislocation operation generates stratigraphic images which reveal the randomness, rhythms, intensities and transitory moments of a reality in constant flux. The exhibition also includes prints of 3D point clouds related to an interactive installation in which these models of urban spaces are transformed according to the fluctuation of environmental data collected in real time on the Web. In the works shown at Occurrence, the pixels of images and the points of 3D models are used as space-time units in order to translate the variability of environmental conditions while questionning the threshold of perception, the vague area where «noise» becomes a source of information. Tuesday – Saturday, 12PM to 5PM. 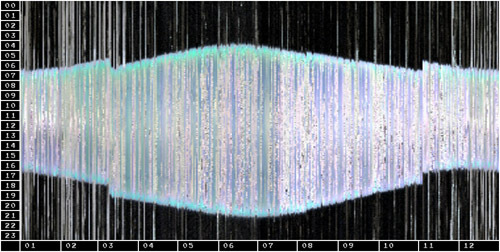 45.5019, -73.5710 [2010-11-12T11:28:52/13:35:29], from the series Chronoscopies. 187 x 107 cm digital print presented in a LED lightbox. 2010. 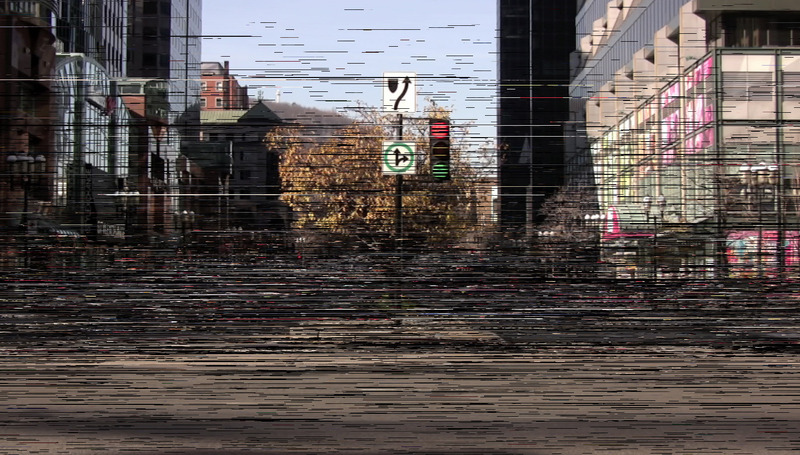 Intersection of Sainte-Catherine West and McGill College. 47.9013, 1.9027 [2010-04-30T16:45:53/18:51:07], from the series Chronoscopies. 83 x 150 cm digital print presented in a LED lightbox. 2010. 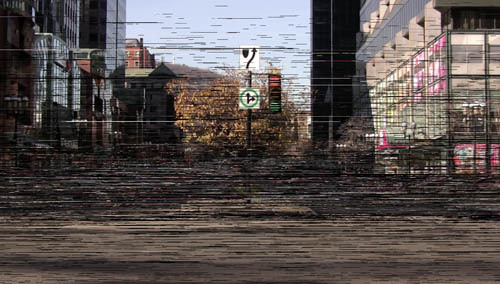 One year sampling of Montreal’s sky used for the media installation Ciels variables (Variable Skies). Thanks to the Canada Council for the Arts for it’s support, to Occurrence, Perte de Signal, Elektra, the Lombart family, Alexis Bellavance, Centre Sagamie, Labomédia, Géographies variables, Nelly-Ève Rajotte, Sonny Harrisson, Benoit Quévillon, Maude Meury-Benoit, Ralf Pickart and Oliver for the videos.